There are 1,800 vacant health and social care jobs in Northern Ireland. The figure emerged during an NI Affairs Committee meeting, which is examining expenditure, administration and policy. The Health and Social Care board chief executive said the employment gaps were proving "extremely challenging" and blamed the pay differential between NI and the rest of the UK. It is hoped the introduction of a workforce strategy will help solve the problem. But Valerie Watts said that a long-term solution was required and not a short-term fix. During the hearing in the House of Commons, the chair of the committee put it to health officials that the £200m of transformation money from the Conservative and DUP agreement may be wasted if it cannot be spent within the required two-year deadline. In response, the Health and Social Care Board finance director, Paul Cummings, said: "Absolutely not. That would not be the case." The panel, which includes four senior health officials, said the money had been ear marked for over 80 transformation projects. Mr Cummings also said that the confidence-and-supply money had been a purely political decision and at no time had health officials been asked for their advice on the timing of the money and how it might be spent. 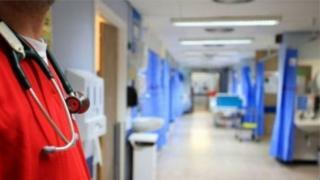 Without an executive in place it has been a while since NI health officials had been grilled on issues such as waiting times, policy and specifically funding. When asked by Kate Hoey MP for examples of what was being delayed as a result of having no health minister, Dr Adrian Mairs said the publication and signing off of Northern Ireland's new suicide strategy Protect Life 2. Dr Mairs said with Northern Ireland having the highest suicide rates in the UK this document could potentially make a difference. Dr Miriam McCarthy said she would call for the publication of a paper around gender re-assignment which would lead to a public consultation. That too requires a ministerial decision. Mr Cummings said at the top of his wish list would be for the minister to sign off on the review of adult social care. Finally, the chief executive said she would ask for a longer term budget such as three-to-five years which would allow officials to plan long term instead of in one year instalments.